Brandon University (BU) is bringing its research out of the academic journals and into the community with a new conference. 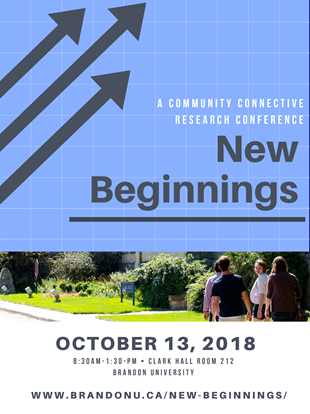 The New Beginnings Community Connective Research Conference will take place on Saturday, Oct. 13. The event will showcase research projects from across BU through three-minute presentations by alumni, students and faculty members. Participants will also hear from people whose efforts to help the local community have been enhanced by BU research and learn how projects are developed and funded. The conference will take place from 8:30 a.m. to 1:30 p.m., in Room 212 of Clark Hall. More details on New Beginnings, including registration, are available at BrandonU.ca/New-Beginnings. Friday is the deadline to submit registrations. New Beginnings is being held concurrently with BU’s Homecoming celebrations. A full schedule of Homecoming events is available at BrandonU.ca/Homecoming.